Our project was borne of ignorance. Digital radios are something that are pervasive in modern society. Yet even as senior-level ECE undergraduates, we felt that we understood them poorly. At Cornell there are classes on embedded systems, and classes on Digital Signal Processing and Digital Communications, but no single class that actually mixes the two. Our product was designed as an effort to get some experience in this space, and as a proof of concept at a low budget radio project for future ECE 4760 students. Neither embedded wireless communications nor digital modems are particularly unheard of in the context of ECE4760. A number of ECE4760 projects rely on monolithic ISM band digital radio Zigbee or Bluetooth ICs (essentially black-boxes) for enabling everything from an accelerometer controlled RC car to wireless pedometers. Our project was largely inspired by an acoustic modem ECE4760 project by Greg Malysa and Arseny Romanenko. Similar to them, a secondary factor attracting us to this project is it's similarity to problems in underwater acoustic communications. Gaining insight in this space would be very useful for Cornell University Autonomous Underwater Vehicle Team (CUAUV), with which Noah is associated. As far as we know our project is the first to combine a digital modem with an off-the-shelf RF stage. We hope there will be more. The wireless modem consists of two identical boards that provide input and recieve output from each Baofeng UV-3R radio. The two boards have several key modules that implement the system: the PIC32 microcontroller, a 12-bit digital to analog converter, a gain stage, and a cable adapter. The center of the system, the PIC32, takes input via RS232 cable which uses one of the two UART systems in the PIC32 (cable shown below). This cable carries the text or other data the user wishes to send to the PIC32, which buffers the input. To comply with our communications protocol, the PIC32 packages the data with sychronization bytes, or a special byte of data indicating the start of a frame. A frame is defined as the longest possible string of bits that can be transmitted without a clock synchronization. Since the clocks of the radio and PIC32s are not identical, the modulator and demodulator can drift out of phase and produce bit errors. Therefore, the PIC32 packages the transmission into a clock pulse followed by a brief silence and then a full frame of data. This pattern can be seen in Figure 2 where the first narrow pulse synchronizes the clock and the rest of the waveform is modulated data. The red and green dots are the locations of the beginning and ending bytes of the signal. The data sent out of the PIC32 is modulated via Minimum Shift Keying (MSK), which is a frequency modulation scheme with continuous phase, which eliminates sharp phase transitions that would otherwise broaden the bandwidth. The modulation occurs at a baseband centered at 1600Hz, and is sampled at a standard audio rate of 44.1 kHz. The radios themselves have a "Push To Talk" feature designed to allow the , the PIC32 toggles an output pin to trigger the push to talk button on the radio. Once the data reaches the DAC, the waveform is output in 12 bit precision and run through a small op amp gain stage that introduces a DC offset to avoid clipping on the output. The output of the gain stage is sent through a TRS cable, which is incompatible with the UV-3R, so a small board re-maps the audio, push to talk, and ground to a TRRS connector, which is widely known as the standard cell phone connector with a band for microphone input (Figure 3). For the project demonstration, the radios were set to the VHF band. The demodulator conducts sampling with the PIC32's analog to digital converter (ADC), which the radio's output at 44.1 kHz. A decoder implemented in software then detects the symbol frequencies associated with either a 1 or 0 by measuring the average power of each bit in both I and Q channels to determine which frequency is dominant. This data is then placed into a buffer and sent out via the same serial scheme as the reciever to a terminal. While consumer-targeted RF modules are cheap, individual RF components are not. In trying to select an analog front end for the transceiver we were therefore stymied. Eventually we settled on a non-ISM dual band amatuer radio hand transceiver, the Baofeng UV-3R, due to it's low cost. By using this as the front end we were able to avoid spending time and money designing the analog sections of the physical layer, and focus on the actual modem. This approach had drawbacks, the UV-3R is designed for FM voice modulation, as a result it's bandwidth is governed by Carson's Rule which states that the total bandwidth occupied by an FM modulated analog signal is $2(\delta f + f_m)$ where $\delta f$ is the peak frequency deviation of the UV-3R, 5Khz and $f_m$ is the peak modulating frequency. By FCC regulation an individual FM channel on the UV-3R in wideband mode could have a width of no more than 25Khz. This meant that ignoring guardband width our modulating frequency would have to be less than 7.5Khz. In fact we found that the radios impulse response severely atennuated anything beyond 3Khz. The band in which we communicate in is regulated by the part 97 of FCC regulations and allows for liscensed use by HAM radio operators. The user of the transciever must have Technician class or higher certification. By convention, band planning within the frequency ranges allocated by the FCC to amatuer radio is handled by the ARRL (American Radio Relay League). A comprehensive listing of the uses for specific frequencies (of interest are frequencies around 145.550 MHz) can be found on ARRL's website.. 145.550Mhz to 145.580Mhz are allocated for "Miscellaneous and Experimental Modes". Noah has a general class amatuer radio liscense (KD2HQW), so all operation is legal. Since the PIC32 implementation would provide plenty of debugging problems without considering the difficulty of implementing a modulation scheme, we decided to simulate the system in MATLAB first. Instead of using MATLAB's helpful modulationg and demodulation functions for MSK, we implemented our own in a style that would be friendlier to port into C code. We chose MSK because of its greater efficiency in bandwidth and because our radios work on FM modulation, phase shift keying would be troublesome as phase is often transformed in unpredictable ways in such a scheme. There were several parameters to select for in this system. 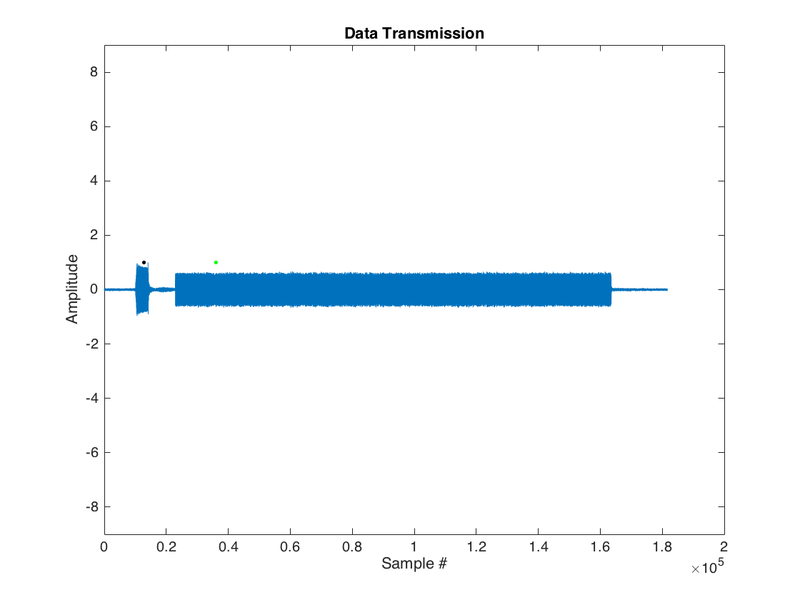 These parameters are center frequency, sampling rate, and data rate. MSK requires orthogonality in data frequencies so that the phases may be aligned on bit transitions. The orthogonality of the different symbol frequencies makes it such that the two are easily distinguishable when multiplied by an oscillator of their respective symbol frequencies. The mathematical definition of MSK is shown above, which specifices a center frequency (first term inside cos()), and has a variable frequency term that moves the waveform either a quarter above or below the center depending on the current bit. This is all continuously phase matched by the term phi, which either is zero or pi depending on whether the signal is transitioning from 1 to 0 or 0 to 1. We initially wanted to have a data rate of 9600 bits per second, but upon realizing our channel bandwidth, we had to lower this dramatically. The simulated channel that was measured consisted of a laptop running MATLAB at the center that would modulate data, play the resulting vector over a USB soundcard to one radio which would be recieved by the second radio outputting into another soundcard on the same computer. 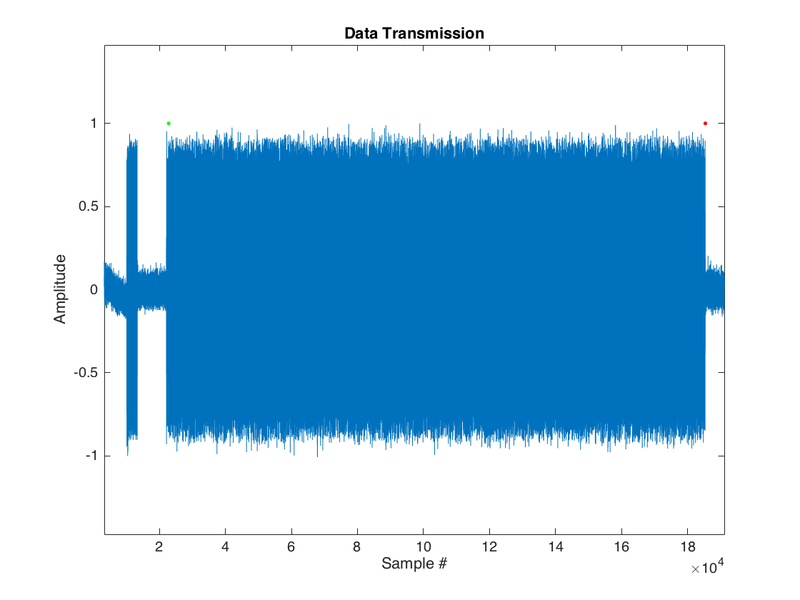 This data was recorded in Audacity and reprocessed in MATLAB separately. 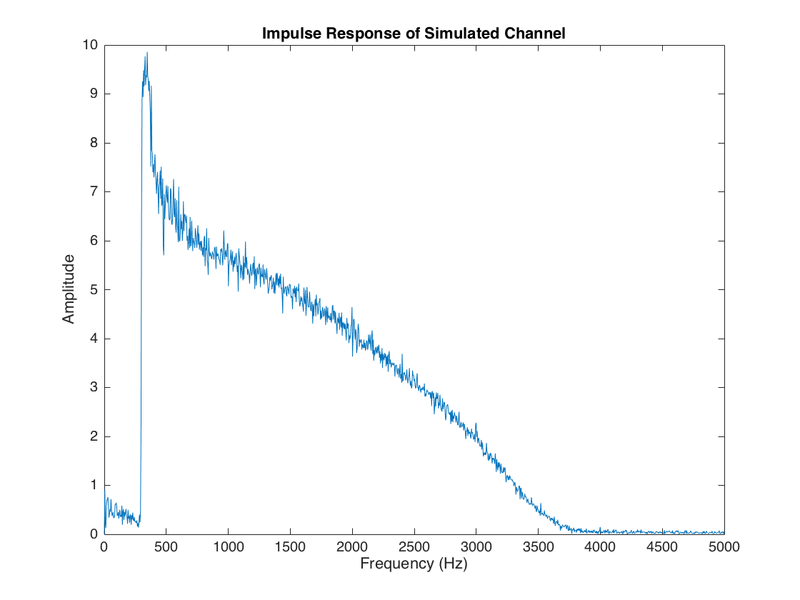 Measuring the impulse response of the simulated channel (PCs instead of PIC32s), which we assumed to be similar in bandwidth to the final system, we found that our usable bandwidth was roughly 3 kHz. Since this was the ideal case with very high SNR, we had to lower our bit rate to acheive a functional system. Realizing this information, we found that the maximum bit rate we could achieve centered at 1600 Hz was 551.25 Bits per second, which seemed to be limited by intersymbol interference (ISI). 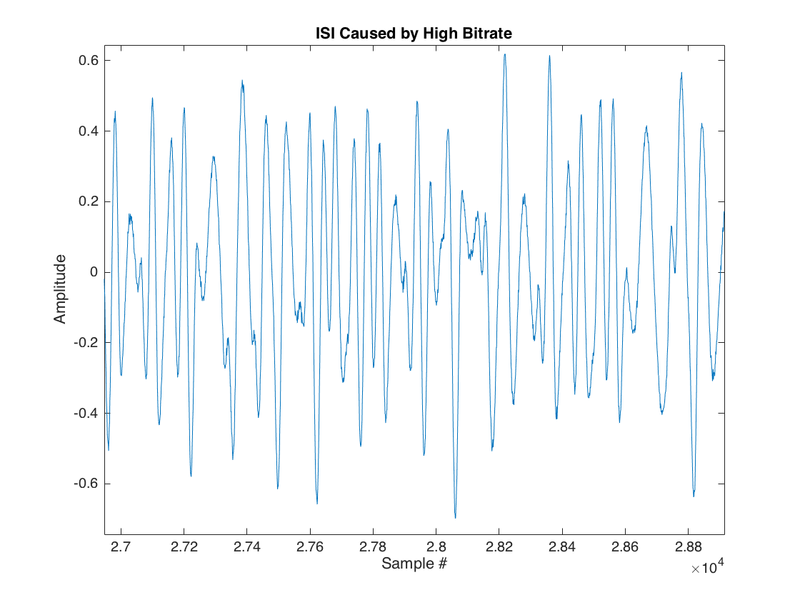 A plot of a simulated transmission showing ISI is shown below. We determined that we needed to perform this correction about every 1,920 bits to safely lower the probability of bit errors to a very low level since we did not implement any error correction codes. Below are links to published MATLAB source code and outputs of these simulations. The hardware for the project is centered around the PIC32, which is shown in the schematic below. This schematic is both a transmitter and receiver as they are implemented on one PIC32 for each end of the modem. The following subsections will breakdown the hardware design and test. Refer to Appendix A for a full schematic. Since we used standalone PIC32s, we needed a way to program without the Microstick II that we had used in earlier labs. The PICkit 3 is a USB to pin header programmer that requires a few passive components surrounding the PIC and 2 programming pins, labeled PGED1 and PGEC1. The PICkit 3 can also supply power and ground, but is somewhat current limited, so we elected to use the serial cable that we used for UART input and output instead. For past labs in this course, the PIC32 relied on the internal RC oscillator to generate the clock, which while the datasheet claims good accuracy, we decided to use an 8 MHz external crystal oscillator to provide a more accurate clock. Crystal oscillators have tolerances in the parts per million, so using this crystal would make our clocks more robust on the sending and receiving side. Since one of the greatest problems we experienced during simulation was missed bits towards the end of transmissions, matching our clocks in separate locations to minimize clock skew was critical to system performance. In the PIC32 project files, we scaled this crystal to match our system frequency of 64 MHz and peripheral bus frequency of 32 MHz. Thee peripheral bus clock timed our interrupt service routines that modulated and demoduated incoming signals, so the crystal oscillator allowed better ISR precision. We utilized the PIC32s UART module to input and output data to the PC terminals that the operator would use to read and write messages. Since our modulation and demodulation were a much higher priority task, using threading tools like Protothreads would possibly interfere with data flow, so assigning the UART to operate via lower priority interrupts was necessary. 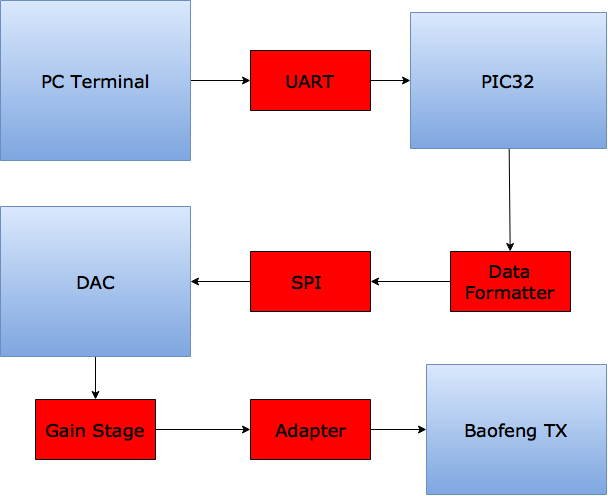 The PIC32 UART module holds a buffer of data that will trigger and interrupt when data is incoming or outgoing, so by configuring an ISR to handle writing and reading the buffer was rather simple. 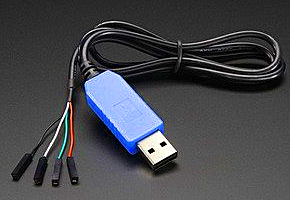 The serial cable also afforded us with a simple power supply from the USB port of a PC, supplying +5 Volts and a ground. We decided that this was a compact and reliable way to deliver power to the modem, provided the supply was appropriately decoupled as the power line noise out of a USB port is somewhat high. Since the PIC32 and DAC ran on 3.3 Volts and our serial cable supplied 5 Volts, we had to downconvert our voltage to supply a 3.3 Volt rail. We did this by connecting two low dropout voltage regulators in parallel (see data sheet seciton for specifications. We used two MCP 1702s to supply a maximum of 500 mA since we believed at the time that with our op amp gain stage, we would have the small chance of exceeding 250 mA. Once we converted the gain stage to a 5V rail for clipping reasons, this parallel configuration simply became a huge safegaurd against any power resets, which at that point were unlikely to occur. In any case, the LDO supplied 3.3 Volts the the outermoost rail on the solder board and was appropriately decoupled with 1 uF capacitors as recommended in the MCP 1702 data sheet. When initially testing the modulator, we realized that the radio was clipping the output of the DAC by introducing a low load impedance. To isolate these two components, we implemented the shchematic below to provide isolation between the radio audio jack and the DAC output as well as gain the outgoing signal by a factor of two to ensure the radio would be transmitting at its maximum potential. Since we were using only a single voltage rail, the configuration of the op-amp required a DC bias since the input was AC coupled (BW1), which we divided equally with 100 kilo ohm resistors to place the center point at 1.7 Volts as the division was off the 3.3 Volt rail. The op amp was running on the 5 Volt rail to avoid clipping. The feedback resistor R2 was chosen to provide a gain of 2, or twice the value of R1. Bandwidth 2 was selected as to pass our outgoing frequency so it was placed well above 1600 Hz. The third bandwidth was not necessary as we did not need to filter the output of the op amp to treat our signal. Since the Baofeng UV-3R is a handheld voice radio, there is a push to talk (PTT) button that triggers a transmission. Just like most smartphones, the TRRS input audiojack breaks out to stereo audio, a microphone, and a ground connection (see the figure in the introduction regarding TRRS and TRS). The microphone jack band on the audio input is the PTT trigger and is active low, so the transistor Q2 in the schematic is meant to short the connection to ground when the board is prepared to output a signal. A pin on the PIC32 is set to high, which drives the MOSFET into saturation, shorting the PTT connection to groung, triggering the radio. The PTT output is connected to an audio jack adapter board which converts from TRS from the PIC32 to TRRS for the Baofeng. The output to the Baofeng connects the audio out from the PIC32 over a voltage divider which divides the signal to ensure the radio doesn't clip the output waveform. The incoming signal has no division because the Baofeng has an adjustable volume knob, which we set to 5 as it was a good level to avoid clipping on the incoming audio. To sample the incoming audio, the PIC32's analog to digital converter was used to sample the input at a rate of 44.1 kHz. The identical sampling rate was implemented by sampling every interrupt that audio was being output to the DAC. Timer 3 counted out the sampling period and the samples were collected in 16 bit integer format from pin 24. All commented code that was used for programming the PIC32 can be found in Appendix B. To configure the PIC32, a header file was made to specify PLL divisors, multipliers and macros for the system clock and peripheral clock frequencies. JTAG programming was also turned off. Since fixed point math was essential in allowing enough time between interrupts when calculating the ouput waveform sent to the DAC, we included a header file that defined helpful functions that converted to and from fix16 (Q16.16) from integers and floating point numbers. This file was identical to the one used in Lab 3, the TFT video game lab. This file was distributed to ECE 4760 students courtesy of Bruce Land. Main.h is the main header file for main.c, which is the modem source code. This file contains parameters for practically all functions in the project. Note that many of the definitions are in both fixed and floating point for flexibility since some times floating point was necessary. This file contains a 1024 step sin lookup table that is normalized to 4096. This data is formatted for the 12 bit DAC that is on the PIC32 board. The length of this vector is defined in the file and accesible as a macro in main.h. Main.c is the parent file for the whole project, containing all the modem implementation. We will start by discussing the serial interface that is implemented through UART. The UART interface is configured for 8 data bits, 1 stop bit and 9600 baud as well as interrupts on every new incoming character. The function initUART() contains all configuration information. When a user types into their terminal that is connected to the PIC32, the UART interrupts, checks flags for RX interrupts and echoes the character if it is a data character (and letter, punctuation), deletes if it detects a backspace, or kicks off a transmission if it sees an enter. Hitting the enter key sets the flag doTriggerSend, which tells the function triggerSend to begin packing the UART input into a buffer ready for transmission. This condition is checked constantly in a while(1) at the end of main() and not in the ISR. 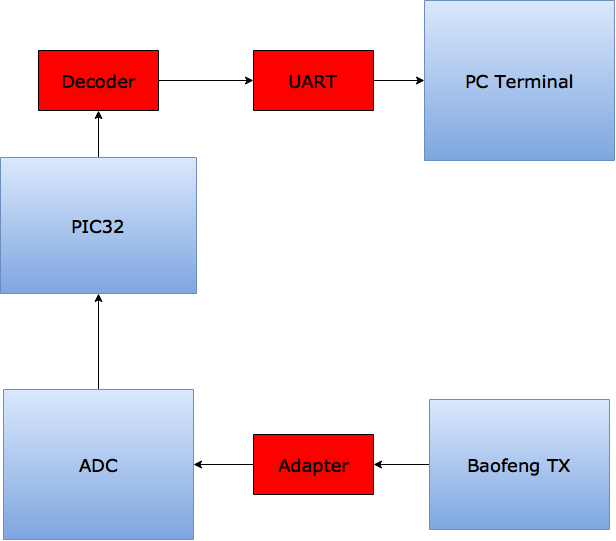 Once the tx_buffer has been packed, the system must wait for the Baofeng to end the PTT transient. There is a spike in voltage when PTT is triggered, which would interfere with any transmission. In the Timer 3 ISR, a counter tracks this on every interrupt and when the wait is over, indicates that it is time to send the clock synchronization pulse. The clock synchronization allows for remote clock recovery and will be discussed in detail further below. Once the clock pulse state is entered, the system modulates 40 symbols worth of a clock frequency (equal to the data rate) waveform. Tones are sent out by stepping phase accumulators through the sin lookup table and performing a first order approximation to better represent the outgoing waveform, as implemented by sin_interp(). After the clock has been sent, we must enter another waiting period in which the channel is allowed to relax to prepare for the data. All waiting periods output the value 2048 to the DAC which is the mid point of its output range. Once it is time to send the data out, the ISR steps through the tx_buffer, modulating each bit with MSKmod(). MSKmod takes the current bit from the tx_buffer, sets the frequency of the waveform, and if it is a different frequency than the last bit, it stitches the phase together according to the MSK algorithm (phase changes are either pi or 2*pi). This transition is tracked by the value of nrz_bit and nrz_bit_prev. To maintain continuous phase when the modulated bit, phase_clip maintains continuity by performing the modulo operation on the current index of the phase to keep it within 0 and 1024. The output of MSKmod is stored in the variable value, where it is then sent out via SPI to the DAC. This waveform is then transmitted out through the Baofeng. Once the tx_buffer is exhausted, PTT is lowered and the state is set to WAIT. 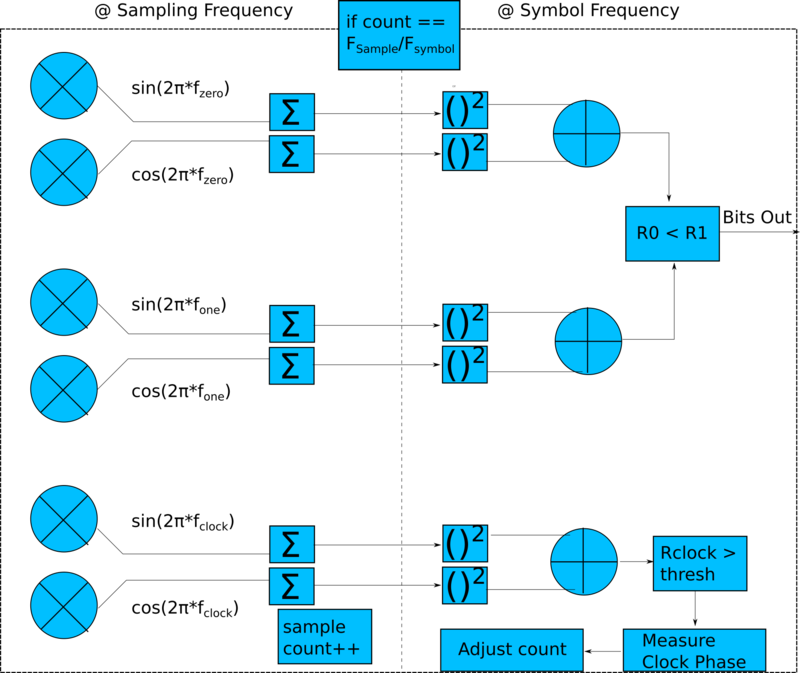 To recieve data, a state machine in MSKdecode was implemented to detect the presence of the clock pulse, which was analyzed via in phase and quadrature counters, and the angle of the clock pulse to the NCO clock pulse corrected the phase error to ensure the demodulator was decoding the proper symbol instead of half of one and half of another. A ring buffer was implemented (decode_ring), which scanned 8 bit sequences for the sync word to begin the reception of data. Once this buffer saw a sync word as detected by checkDecodeRingEquality, MSKdecode was called to begin receiving data by measuring the amount of power in each sample compared the the NCOs for either a 1, zero, or clock. Once the defined number of samples in a symbol was reached, the in-phase and quadrature components of each symbol type are compiled and the one with the most power was declared to be the bit received. The selected bit is then added to a buffer, recvd_buffer, which collects symbols into bytes until 2 sync words are detected that then end the transmission. 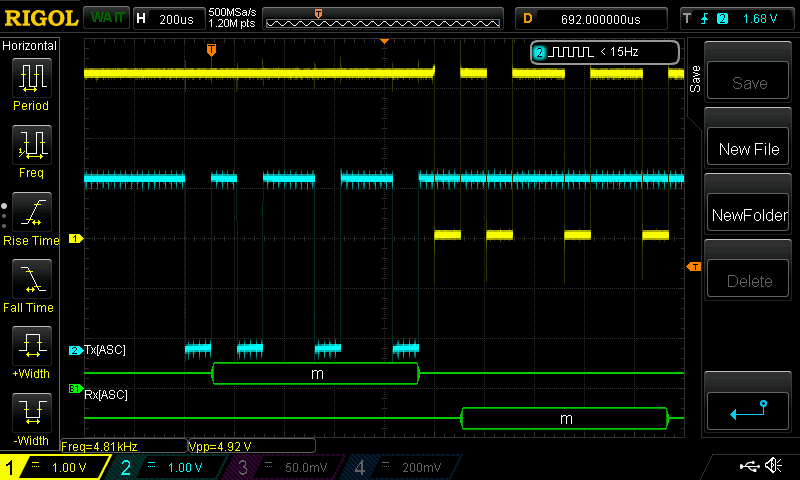 This buffer is then sent over UART to the received terminal where it is displayed. The done() method is invoked, which sends the data and resets all phase counters and indexes used so that the next reception can be accurate. 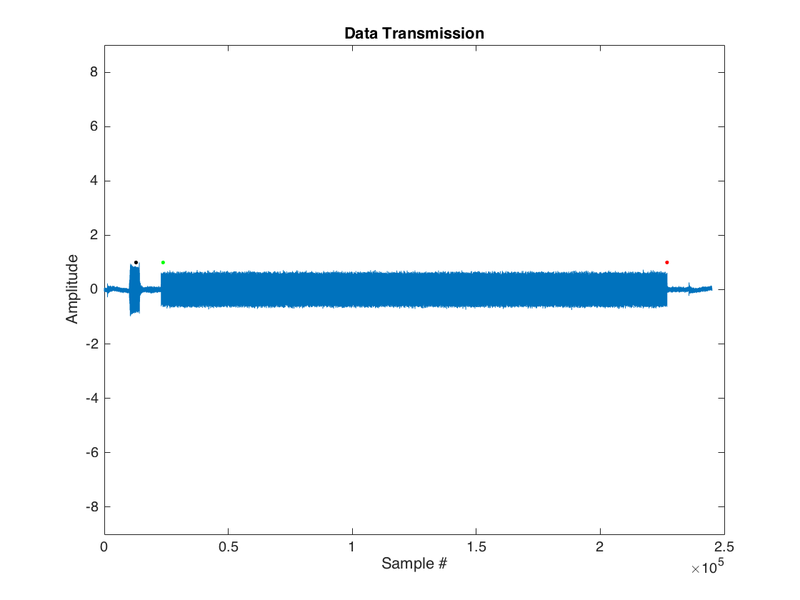 When testing the radio setup, we encountered reasonable success transmitting and receiving both from PIC32 to PIC32 and from MATLAB to PIC32. The latter was important as before our demo, a still unsolved problem destroyed one of our boards, but we were still able to prove functionality using one transciever board. On average, transmissions were decoded correctly about 50-60% of the time if short in length. The input tested was 'ECE 4760'. Longer inputs fared poorly, being decoded only 10-20% of the time. These inputs were anywhere from 35-150 characters long, or 280-1,200 bits. This can almost certainly be attributed to clock synchronization, which plagued our simulations since the beginning of the project. Below is the final block diagram of and demodulator. To verify and debug UART operation, we captured a waveform on the oscilloscope of an input character and its echo, shown below. 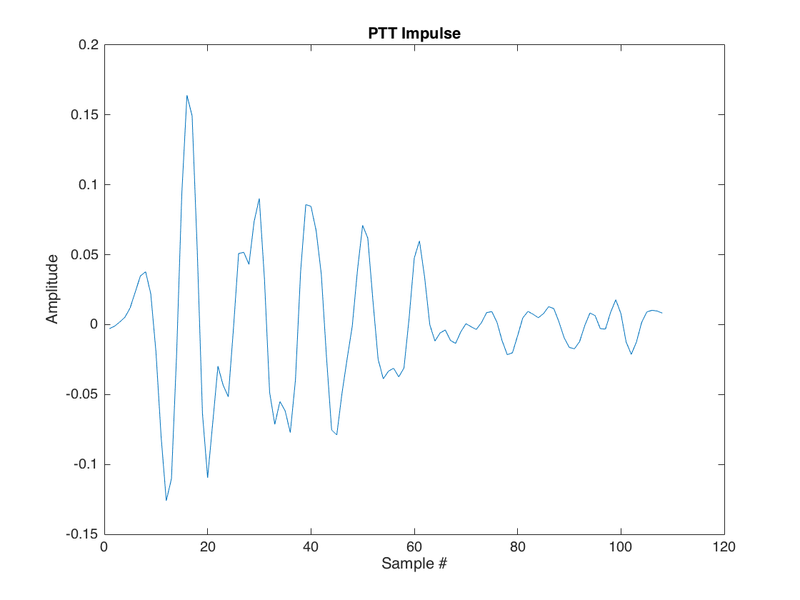 The reason why we implemented the PTT_WAIT states is shown below as the impulse response of the triggering of the radio. After finishing our implementation, we were amazed at how many different error modes were possible for a simple modem like ours. While we achieved success without error correcting codes or coding algorithms, a lot of work was put in to simply transmit at a low data rate over short distances. If we were to redo this project, thinking about coding our data with parity or other error detection would be critical. In addition, exploring other radios that did not have such a narrow channel would be worth looking into since the Baofeng was intended for voice, not digital data transmission. Our choice of MSK was the right one as we made the best use of our limited channel bandwidth and succeed in a fairly clean implementation. The hardware used in this project could have been slightly better researched as our audio cable incompatability made our project slightly bulkier than we would have liked. We would have also tried to get software written to have the PIC be programmable, serial interfaceable, and powered by the USB cable soldered onto the board. However, this was exceedingly complex and not feasible in the time given. On the software side, we did our best to compartmentalize operation well so that the code was fairly modular. We would have liked to fiddle with the parameters we left openly defined and accesible, but in order to maintain the best performance at the settings we had, we concentrated on debugging the final configuration as listed in Appendix B. The design however adhered to standards set by the FCC as we did not modify the radios in any way other than setting them to lower power mode. With respect to the IEEE code of ethics, we adhered to the code of ethics as shown below in our references section. Resources found on the internet were invaluable to our success as MSK is an old technology. In particular, Dr. Aoife's lecture was helpful on non-coherent demodulation of MSK. To ensure we were operating within the law, Noah upgraded his HAM radio liscence and Geoffrey read FCC regulations and took practice tests on relevant VHF regulation. As the code mandates, all claims in this report are accurate to the extent of our collected data, especially our received data success rate. #define backspace 0x7f // make sure your backspace matches this! if(SYNC[tx_bit_idx]) //If that BIT turns out to be a 1.
if(SYNC[sync_idx % LEN_SYNC]) //If that BIT turns out to be a 1. //If we are done waiting after the clock, lets transmit! *    1. Setup SS as digital output. *    2. Map SDO to physical pin. Moloney, Aoife. "Non–Coherent Detection." School of Electronics and Communications Dublin Institute of Technology. Apr. 2005. Lecture.